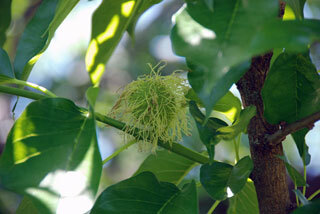 Also Called: Hedge-apple, bois d'arc. Trunks: Short; bark dark orange-brown, shallow furrows, frequently peeling in long, flat strips; branches arching upward; crown low, rounded. Twigs: Frequently zigzag, greenish-yellow or orange-brown, armed with stout, straight spines, to 1 inch long; buds often paired, larger one reddish-brown; leaf scars half-round or broadly triangular; bundle scars several, arranged in oval. Leaves: Alternate, simple, deciduous, egg-shaped to elliptic-lanceolate, 1.6 to 4.8 inches long, .8 to 2.4 inches wide, thick, firm; upper surface dark green, shiny; lower surface paler; margins entire; tip long-pointed; base rounded or bluntly tapered; stalk slender, .8 to 2 inches long, grooved on top, usually somewhat pubescent. Flowers: Male and female flowers occur on separate trees; staminate flowers in dense spherical or oblong clusters .5 to .8 inch in diameter; flowers small, stalked, yellowish-green, hairy; stamens 4; anthers yellow; pistillate flowers in dense spherical heads .6 to 1 inch in diameter, sessile or short-stalked in leaf axils; calyx 4-lobed; styles long, conspicuous, thread-like, yellowish. Fruit: Autumn; aggregate of many small fruits in orange-like ball, 2 to 6 inches in diameter, pale green, lumpy, wrinkled; fruits small, fleshy, grown together; juice milky, sticky; seeds oval, .3 to .5 inch long, pale brown. Habitat: Hedge rows, shelter belts, woods, ravines, fence rows, waste places; rich soils. Uses: Osage orange provides cover for song birds, game birds, and wildlife. Rabbits and squirrels eat the seeds. The Kiowa used the bark of the roots to make a yellow dye and the Comanche, Omaha, Pawnee, and Ponca fashioned bows from the branches. The roots were boiled and the liquid used as a wash for sore eyes. Comments: Osage orange was often planted in wind breaks. The wood is bright orange, very hard, strong, heavy, coarse-grained, and is highly durable. Limbs and trunks are often used for fence posts. Bois d'arc means "wood of the bow". Maclura honors William McClure, an early geologist. pomifera means "fruit-bearing".